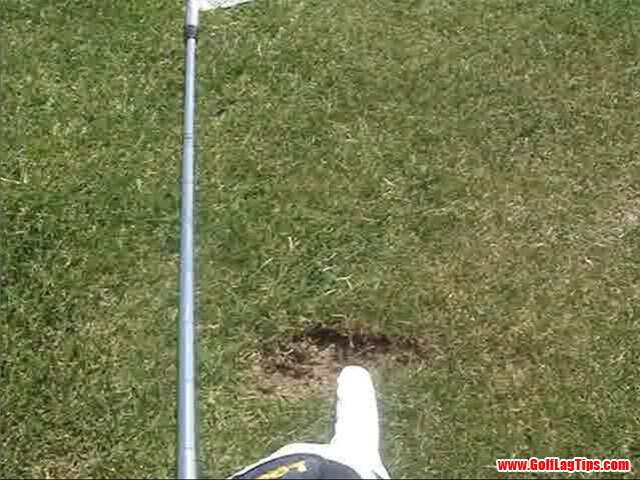 A few years ago, my divot location was starting just under the ball and I thought that was not too bad. I was shocked when I discovered how much ahead of the ball it should be if you really hit DOWN on the ball and compress it properly. It’s common for Tour Players to create divots starting 3 inches after the ball!!! Lets have a closer look at this phenomenon and tell me if you’re as shocked as I once was! Ball first, turf second: keep moving your hands forward! The divot located in front of the ball with irons is a natural byproduct of clubhead Lag. As a consequence, you can look at your divots to check how well you are compressing the ball with a descending blow. If your divots start before the ball, you certainly stop/decelerate your hands at the ball. The only way to create a divot after the ball is to drag your hands as far as you can towards the target on the downstroke. If you are used to stop your hands at the ball it will feel like your hands are going past your left leg at impact (and of course this is not the reality but just the correct FEEL!). Hi Zach, according to your level of play, I would recommend using an impact bag. A pilow could do the trick. Gently hitting on such a bag can give you the proper feel. You’ll see that your rythm around the impact zone will be a lot different. Do it, and look look look (left wrist flat at impact for sure). You’ll see and feel what is missing in your game. You can see this perfectly illustrated when you see the professionals hit iron shots on television in slow motion. The key as mentioned is hitting down and through the golf ball. I think what helps this is ensuring both arms are fully extended through and past the impact zone. 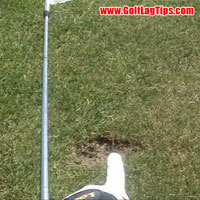 This ensures you are compressing the golf ball and creating the right sort of divot. You are right Troy, the right arm plays an important role here. For a nice compression, the both arms straight position (aka the end of the followthrough) must be reached way after impact. This guarantee that you strike the ball with enough bent in the right arm to continue to go down and out after impact. But as you said, you must be committed to extend that right arm through the impact zone, either by letting centrifugal force doing its job or by actively straightening the right arm (Hitting stroke). Thanks for the great advice john,this is by far the best site on the net to explain and feel lag,I have studied every site on lag for the last couple of months and none gets close to yours.I will recommend this site to any1 that will listen.Keep up the great work! I have bought lag training aids in the past such as wrist straps etc.,but to no avail until i came across your site. Once again thanks very much for passing on your invaluable knowledge on the great “mystery” that is LAG. Tanks for the compliment Paul. The PBS is a great yet very simple device to efficiently work on the lag. You could say that I know how to play with quite a decent lag but I sometimes grab my PBS out of my bag to check how secure I am with my lag pressure. Sometimes your lag pressure is not as strong as it should be and the PBS really tells you how well you are doing. A very handy little device in my opinion. 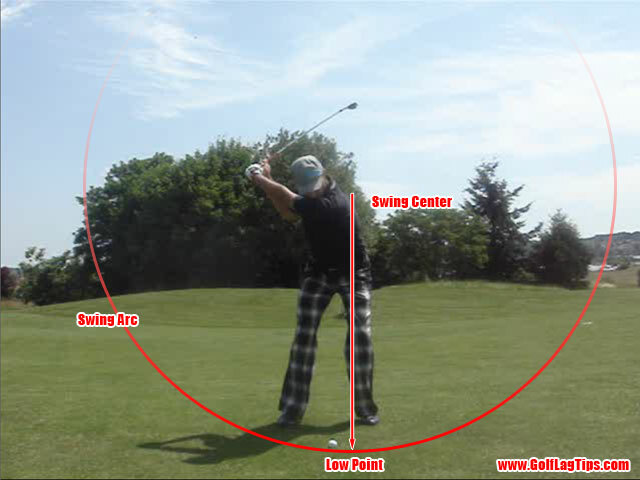 Thanks for the advice,ive straightened up my shots by initially starting the down swing with my left hand too instead of the right doing all the work.1 more query i have though is, just before the top of the backswing i have started to transfer the weight to the left leg and i am feeling more lag and i am also feelin like i am dragging my arms to the shot,the divots are after the ball too, is it ok to start the weight transfer before the top of the backswing? You are doing very good and obviously understand the way Lag works! Weight transfer, aka Body Power (aka Power Accumulator #4 for TGM fans) is the first power source to activate when performing full swings (aka Total Motion). This is the way to load the Lag on full shots. And you explained it perfectly: “just before the top of the backswing i have started to transfer the weight to the left leg and i am feeling more lag“. You already know that Lag is felt as a pressure in the right index finger (pressure point #3 – PP#3) – this holds true from a chip shot to a drive and during the entire downswing to the both arms straight position. However, you can increase the Lag as it is required on full shots by adding more “power accumulators” to the equation: the one your are now having fun with (power accumulator #4) can be felt through a pressure between your left arm and the chest (pressure point #4 – PP#4) when you transition from backswing to downswing. 1) Start loading the Lag using weight shift – body power. You will feel pressure in PP#4 first and PP#3 shortly after. 2) Speaking with your words: “drag your arms to the shot” with that. 3) As you come to impact, you will feel that the pressure is going away from PP#4 while still feeling strong in PP#3. This is normal and you are experiencing that “sequencing”. 4) Just after the both arms straight, you will feel PP#3 going away. 5) Perfect shot miles away ! “i am also feelin like i am dragging my arms to the shot” : GREAT! – this is a natural byproduct of the Lag and you are starting to experience its benefits (same story for me, look in pages 105-106 of the book!). No need to consciously provoke that. It just falls into that slot the same way a trolley will always follows you on the right track when you pull it. The more the Lag, the easier the arms and club will fall into the slot! Just to add to that john, because i feel the lag at #pp3 i feel as if the right hand is taking over the swing causing me to hook it.How do i start the backswing more with the left arm while still mainyaing the lag pressure with my right trigger finger? Hello Paul and welcome aboard! I’m delighted to see that the teaching produced the desired results and that you are now enjoying the benefits of the lag! Getting some Lag pressure feel in your hands is the first, and very often the most difficult, quest to solve. Now that you have it done, you must direct that Lag pressure feel along the proper path to ensure that your hands/club face behave properly. The answer to that is ‘tracing‘: once you get that pressure feel in your right index finger, you have to move that pressure along the base of the plane. Think of painting a straight line on the ground as if a laser was attached to you pp#3. By doing this, you ensure that you are delivering the lag on plane. In your case, check if your line is not going to the right or if you are not tracing a curve instead of a line. hi john, i purchased your e book yesterday about creating and sustaining the lag, and i must say i am amazed.I hit the range today and i was hitting balls 30 yards further, thanks very much for the great info.The only problem i had was that i began to draw the ball alot where as before i played with a slight fade.Can you tell me the reason for this and explain how to straighten it up? Do yourself the biggest favour ever in your golf life, find a range that enables you to hit off the grass, learn how to take a divot after the ball, your game will be completely transformed! Ian is right, hitting of the grass is the thing to do if you want to do it right! In my early years of playing I had a golfing facility nearby that was only having synthetic mats. I practiced there very often during two years thinking that hitting tons of balls was going to improve my game. I would have been better not to have played at all! It took me at least one more year to undo the bad habits I’ve ingrained hitting of the mats. I’m not saying that it is impossible to practice well with the mats but it is certainly more complicated to produce a geometrically correct stroke if you’re not allowed to take a divot. As a result, on a mat, low point for any club cannot go below ground level! And you certainly know now that low point for ANY stroke is located in front of your left shoulder. The difference between the driver and a wedge is that the club enters the ground after impact for a wedge and the ball is located AT low point (which is above the ground) for the driver! Knowing that, on a mat, you are restricted to always place the ball close to low point in front of your left shoulder. This is suitable for the Driver, Woods and 3-4 irons but not very good for other irons (forget about the wedges!). If you still want to play a 9 iron for example, you can very well hit a shot with a ball in front of your left shoulder but you would be practicing a special shot flying very high – while it may be fun five minutes, this is definitely not the best time to spend your time practicing. Go find some turf to destroy! Thanks for your reply. I just ordered some practice balls and will be going down to the local common early in the morning when nobody is around to practice taking a divot. John in your reply you keep mentioning the right shoulder, but I think you mean left shoulder for a right handed golfer? One final question then: If I do find myself at the range and want to hit a few 7 irons, would I be better hitting them off a low tee. That way I could continue my swing to the low point, but still be above the mat. Yes, nice catch, I meant the left shoulder instead of the right – I dunno what I was thinking! I edited the reply to correct that. Yes, hitting of the tee on a mat is suitable for a 7 iron but you’ll miss the turf contact feel and you risk being shy entering the ground on real conditions. To simulate that, tee the ball no more that 1 inch around mid-stance, hit the ball first then slightly brush the mat at low point to simulate the ball/turf feel. Remember that with a ball placed mid stance, low point is in front of your LEFT shoulder but also OUT from the ball because the swing operates on an inclined plane. As a result, after impact you must feel that you continue going DOWN and OUT and not just DOWN. Continue the good work and do not hesitate to keep us informed of your findings. I really want to try and add all of this to my game. I’m in the UK and I practice at a driving range that has synthetic mats to hit off (We call them astro turf over here). Is it possible to practice the lag technique without being able to take a divot? Hi John. 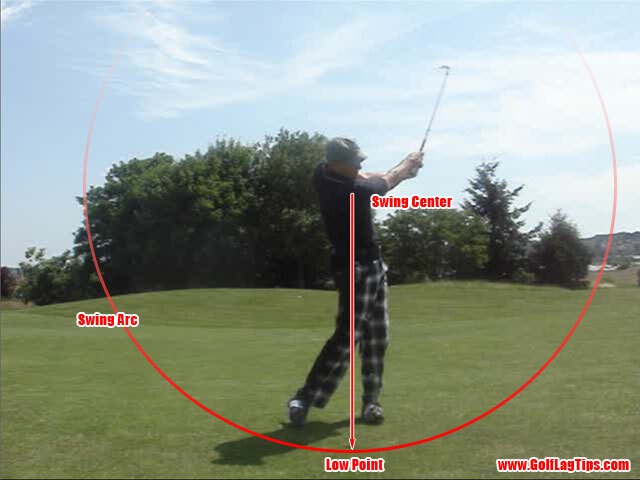 Regarding the driver, I’m able to Swing the driver by shootiing my right elbow and arm down my right leg. The shots are about 250 with a little more roll. Lately, Kevin has turned me onto a very nice set of Titleist ZB’s. I have spent most of my time rediscovering the joy of Hitting and a very stable head. I can simply trace my # 3 PP smoothly up to my shouder and drive my elbow back down while the # #3 PP travels up. My distances are 1.5 clubs longer almost with a sweet sound and high, penetrating, trajectory. My ball position is at my belt buckle or slightly back for all irons. This is sensible since my front leg is 1.75″ shorter so my DOWN ball position must be further back from my left heel. logically set my weight back on my right side so my driver could start slightly more level or DOwn plane on the Hit so the left arm leash actually heads more up? Very informative John! I did not realize the lag may be sustained so long. I’m wondering, if I hold the lag well past my front leg (or feeling like it), is it necessary to do so at a faster speed? In other words, the pro swing looks so smooth and unhurried. Is it mainly the sustaining of the lag so far past the ball, or is it speed and lag in balance? im right handed but hold the club like a left hander would. my shots are ok and its comfortable for me . i play with right handed clubs, just my left hand goes under my right on my grip. is this ok? thanks. john, dublin, ireland. This product is a great way to hone in your ballstriking accuracy and consistency. It shows exact point of impact, swing plane and club face position. Putting the visual with the feel shortens the learning curve and develops muscle memory much faster. I still have a long way to go, but it has made a huge improvement in my ability to deliver the club to the ball more consistently and accurately. Oh….just wanted to ask you something though. I think it is really important to clear your hips when you swing DOWN and OUT. Swing down and out is similar to hitting from inside and out, right? In order for a club to come from inside you need a space btw your hands and legs. And without clearing hips, you just do not have that space and it will lead you to come from outside. Bad Hook Shots!! What do you think John? I can not thank you enought for your help by providing priceless information about golf swing especially on lagging. It took me 3-4 days of practice on a driving range, which I spent almost 7-8 hours total. At first it was so frustrating, but kept believing things that I had read here….then guess what….I had that HAHA moment you talked about. Right now, I am struggling with hooking the ball which I normally do. I record my swing often and realized that my hips were not cleared, and believe that it was causing all this bad hook shots. I can not wait to show my new swing to my buddies at the course!! It’s nice to know you are OK, John. Have you read Bobby Clampett’s book? First of all, sorry everybody for the long blackout. I was unfortunately put away from golf since September because of a huge heap of work after summer holydays and mainly because I completely ruptured my Achilles tendon while attempting a comeback in playing Tennis! 6 weeks in a plaster and a total of 6 months of reeducation! Tomorrow is a great day: I’ll remove my plaster and should be allowed to walk very carefully! Expect me to become an awesome putter because this is the first thing I’ll go for as soon as I can jump in my car and reach a golf course! The second thing will be to reactivate my site. Be assured that I will answer EVERY question that hasn’t still got an answer from me during the last months. So be patient a few days more and I’ll be back with a lot of very exciting stuff! Thank to all for your support! A book to read while we wait for this site to become active again: “The Impact Zone”, by Bobby Clampett. I just finished it. Bobby Clampett has been taught the Golfing Machine by Ben Doyle. In the Impact Zone, he clearly explains how to develop, practice and apply the Five Swing Dynamics: flat left wrist at impact, forward swing bottom, loading, lag and pivot, straight plane line. There is also an extremely interesting chapter on the influence of equipment on the swing I had not realized that improper equipment can require a bad swing to produce acceptable results. Or that “game improvements” irons become a handicap when one develops a good lagging swing. In the Mental Dynamics chapter, he explains how to make the load/lag swing concept work in the real world. It’s all very accessible and entertaining. Bobby Clampett writes candidly about his own carreer and experiences, as well as the many sacred cows in today’s golf teaching. I have been using the PBS and my game has been improving. However I recently moved and the course I play now is hard pan. I have never played that before. I am having a hard time being consistent with my irons. I have always been a digger and am trying to work away from that but I am hitting some hand jarring shots. Any help you can give on keys to more consistent iron play off hard pan would be appreciated. I’ve been toying with buying a Taly Mind Set but can’t decide if they work or not….some reviews say thy’re great,others not so? Any chance of a review Greg? Great explanation, the duffer really has the hardest time understanding this concept. Clubhead lag is the product of constant acceleration through the ball. Can’t do that with accelerating at the top! I will say for me when I properly execute the golf swing and create a good divot I get that deflection feel in the shaft as the clubhead enters the ground, combine that with a sweet set of blades….butter! I would recommend anyone who is having trouble getting the concept of the hands ahead of the ball go out and by a Taly Mind Set training aid.